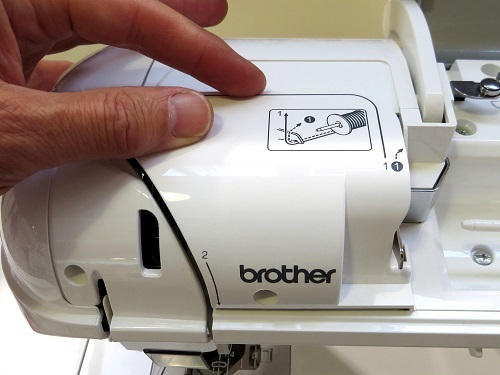 It’s unusual on a Brother machine to need to adjust top thread tension for embroidery unless you’re using unbalanced thread, such as a heavier than normal weight of thread or perhaps a metallic etc. In this case your instruction manual will explain how to temporarily adjust tension for the design you’re undertaking. When you choose another design it will revert back to default tension setting. I don’t recommend adjusting default setting of top thread tension. If your bobbin case is correctly tensioned then default should work perfectly. 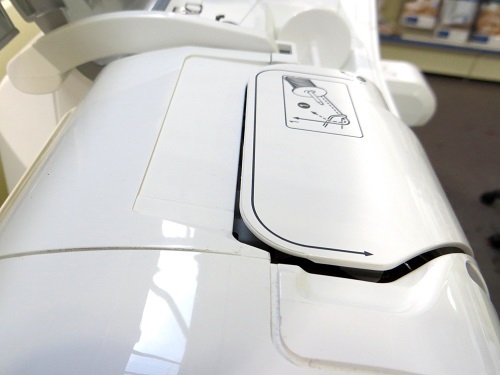 Important Note: Safety First – SWITCH OFF the machine before undertaking any removal of covers or putting your fingers under the needle bar or inside the machine etc. 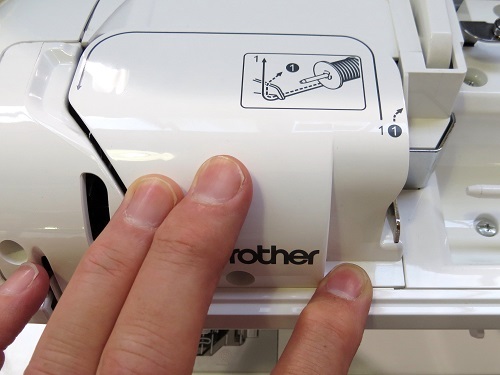 Also don’t invalidate your warranty by damaging your machine, only undertake these steps if you can be confident of doing this type of action and don’t “force” any part into place – Brother products are manufactured to a high standard and don’t need brute force at any time – just knowledge and care. Sometimes, for no apparent reason and very suddenly your top thread can start behaving badly. Lets assume that you are using a thread that normally sews OK and that your design isn’t anything that is out of the ordinary, fabric well stabilised etc. If you’re unsure then set up a simple test fabric and stitch a letter A as per my other blog Correct Bobbin Tension for Embroidery. 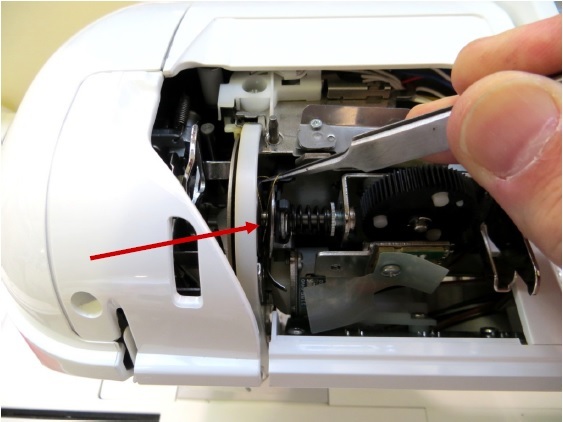 The most common problem attributable to poor top tension is that your thread “nests” under the fabric or needle plate when you start to embroider or sew or you may get very loose stitching on top of the fabric. The problem is likely to be thread caught in your tension disks. You can check this easily by doing the following. Thread your machine as normal and select a design or stitch (if in sewing mode). Make sure that you take your design right through the screen stages to the point where the machine is ready to start embroidering. With the presser foot in the UP position the thread should pull easily through the needle eye to the back of the machine. With the presser foot DOWN the thread should slightly bend the needle and be much tighter when pulling through as in the image on the right. If this is ok then your issue with nesting is more likely to be a problem below the needle plate such as a damaged bobbin case or burr on the needle plate or similar. If the thread pulls easily through the needle when it shouldn’t then you’ll need to check out the top tension unit for contamination. The following example is for an Innovis 4000/5000 but most models are similar in that they have a cover that is removable. You’ll need quite a slim screwdriver to reach the screw on some models and I find it’s handy to have one that is magnetised at the tip. Before removing the cover make sure your presser foot is in the UP position and then switch off the machine. Remove the screw and put it somewhere safe. Lift the cover from the back and pull towards you, there is a clip at the front that can be a bit tricky so carefully keep pulling until it’s released. Raising the presser foot opens the tension disks making it easier to see between the disks and also gives better access with pointed tweezers or an old needle or pin – anything to fish out the offender from between the disks. Sometimes this can be a large piece of knotted thread or a tiny speck of fluff trapped at the very back of the disks. Check thoroughly and give it a blow out the system with compressed air if you can. Once you are happy then reassemble and test tension as before. When replacing the cover you need to put it on at the back first, locating the two lugs on the cover with the two locating pins. Then clip in at the front gently. Don’t force at any stage. Hi, thank you for this page. at least i know im not alone. just wanted to ask, for the top tension will there be any tension difference when i pull it when i set it at -8 or +8. It feels the same to me, and i am wondering if there is a problem with my tension disk. Hello, I would expect you to feel some difference though it wouldn’t be huge. The difference betwen each setting between -8 and +8 are really quite small and would be used to “fine tune” for different threads and fabrics etc. Keith. Thank you for a really useful blog. I hope so Sarah! I get concerned about everyone rushing to their machines with a screwdriver lol but I’ve tried to make it easy to follow and most enthusiasts should be able to self-help. Keith. Excellent info on removing and replacing cover plates, thank you.